America Japan Society held February Lecture Program “America and me: a lot of gifts America gave me” on February 12th at the conference room of White & Case LLP. We welcomed Ms. Reiko Yukawa, a renowned music critic and lyricist and Mr. Ichiro Fujisaki, President of the America Japan Society moderated the latter part of Q&A. Ms. Yukawa related the time when she first got impressed by American music, the experience as a disc jockey in Japan and America, and the days she created lots of popular songs as a lyricist. 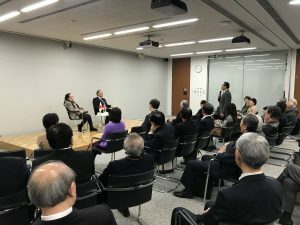 In the Q&A session, over 50 participants casted various questions such as the one about the Grammy awards 2019 and about recent popular music in Japan. Ms. Yukawa, Mr. Fujisaki and the participants had lively discussion. Though America-Japan relations were often discussed on political and economic affairs, it was impressive that Ms. Yukawa’s story showed also deep cultural relationship between Japan and America.